One early spring day in 2007, a curious group of worshipers gathered at Mahakaleshwar Jyotirlinga, an 11th century temple in Madhya Pradesh, India. They came not to pray for blessings for themselves or their families, but for something that at the moment seemed much more important. "As the World Cup is being played," said Prakash Trivedi, a local storekeeper, "a willow has been offered to Lord Mahakal from Hindu-Muslim unity praying for the victory of Indian team." The willow tree branch in this case was a crude oversized cricket bat, given to Lord Shiva with a simple request from fans of both faiths: success for India in the Cricket World Cup, which began that day. The scene played out in March of that year, and similar scenes have undoubtedly played out across South Asia in the past month as the 2011 edition of the ICC Cricket World Cup has come around again. Yesterday, the Indian national team nipped the Pakistanis in the semifinals in a competitive match, 29 runs, and a home game for the Indian side, being played in Mohali, not many miles from a still-disputed border in the Kashmir, the oldest unresolved international conflict in the world. As always, more than the sport is in play. India and Pakistan, two nations inextricably wound for 64 years, seemingly have but a single thing in common: cricket as a national pastime. "It is said that the British Raj left two legacies for the subcontinent," said NT Fazalbhoy, a lecturer in sociology at the University of Mumbai. "Partition, and cricket." Ping-pong diplomacy was left in the '70s. Béisbol diplomacy got its chance in the 1990s and wound up being just a fancy name for players on one side attempting to defect to the other. This is a new century, however. This is the century of cricket diplomacy. In 1990, right-wing British politician Norman Tebbit, discussing the undercurrent of mistrust of the U.K.'s burgeoning immigrant population, came up with something he called "the Cricket Test." "A large proportion of Britain's Asian population fail to pass the Cricket Test," Tebbit said. "Which side do they cheer for? It's an interesting test. Are you still harking back to where you came from or where you are?" In other words, it is a test of "otherness." India is a land of distinct and wholly separate populations, living side by side. And their loyalties are not only to sport and government, but also to God and tribe and sect and clan. The "cricket diplomacy" stories would have you believe Indians and Pakistanis are coming together at the oval, but they gloss over the deeply held beliefs that constantly undercut progress. When I was in India in 2007, I reported and wrote much the same story, with a Westerner's typical lack of nuance. Wrote of the more than 4,000 Pakistanis who were granted special visas to travel to India for the test series, many of whom were returning for the first time to a country they had only heard about from their parents and grandparents. And the 2011 World Cup seems like a rerun. This time, it was 5,000 visas issued. They are notoriously difficult to come by, and the Indian authorities make a show of issuing them by the thousands whenever the two nations play a big match. The spectacle is irresistible for politicians. Earlier this week India's prime minister extended a surprise invitation to his Pakistani counterpart. The prime ministers appeared together in the grandstand in what the press took to calling a "mini-summit" despite the lack of any agenda, and the two were reportedly "all smiles." In American politics, we'd call this a photo-op. "Did the United States and China avoid nuclear war because of ping-pong diplomacy?" asked JK Tiwari, a political science professor at Banaras Hindu University. "Probably not by itself. But it is harder to demonize an entire race when you can put a face on it. We think twice about launching a bomb if we think we know people on the other side, even if we only know them through television." Twice before, the country's prime ministers have met at an India-Pakistan cricket match, and whatever happy symbolism the moment provided, it soon gave way to actual events on the ground. Twenty months after I wrote my own cricket diplomacy story, a Pakistani-born and -trained group of young men launched a spree of terror attacks across Mumbai, killing 164 people in the name of religion, and we were once again in the philosophical realm of the Cricket Test. Which side do you cheer for? And yet, the occasional hopeful sign. An unlikely stage: the Wagah border between the two countries. Located in the Punjab, the province that hosted yesterday's World Cup semifinal, crowds gather every evening for the ceremonial border closing to madly cheer on their respective country in a scene more reminiscent of a cricket pitch than anything else. Two young boys stood on the Pakistan side, peering through the gate at the towering stone-faced soldiers. Each boy wore a third-rate knockoff of a popular cricket shirt. I gestured inquiringly at them. The first boy proudly stuck out his chest, tiredly said "Sachin," as if it were silly to even ask. Sachin Tendulkar, an Indian, was and is the world's most popular player, one of the best batsmen in history. His fame, much like Michael Jordan's, crosses borders. "The British left two legacies for India: partition, and cricket." But they have faced off many times through the years, offering a glimpse into the complicated dynamics of India-Pakistan relations but not — as those cricket diplomacy stories would have it — a solution. When the young nations played for the first time in 1952, it was Indian Muslim Ghulam Ahmed whose batting led to an Indian victory. "The fact that Ghulam Ahmed was a Muslim added to the poignancy of his efforts," wrote Omar Noman in Pride and Passion: An Exhilarating Half Century of Cricket in Pakistan. "It was if a Jew had scored a goal against Israel, playing for an Arab team." In 1978, Indian commentators referred to wicket-keeper Syed Kirmani by his surname only, because it was also a common name in the Sindhi community, one that saw huge migrations on both sides during partition. It was as if the commentators wanted to remind listeners of the pride at stake. Not national — but regional, tribal. The kind of appeal, in villages and extended families that offers a more palpable sense of identity in their lives. Identity in the subcontinent isn't a checked box on a census form. It's a fugue, with many variations. Borders are mutable and theoretical. But sectarian allegiances are permanent. It's why the cricket diplomacy column has had to be written every time the nations face off, and why it will have to be written again and again. A striking illustration of identity was given to me by Delhi-based sportswriter Gulu Ezekiel, born to a Jewish father and a Parsi mother. He considers himself part of two tiny and still-dwindling religious minorities in India. He is a cricket fan, too. "I was raised without a solid religious identity," Ezekiel explains. "I would be in a tiny minority no matter which of my parents' faiths I embraced. So I embraced the secularism that was such a big part of India at the time. Then came Farokh Engineer." Engineer was the nation's top keeper in the 1960s and early '70s, but more importantly to Ezekiel, he was a Parsi. "I was a kid," he said. "He was my hero. I was proud to go to school and tell anyone who would listen that my people produced the greatest wicket-keeper of all time. That was my identity." Religious identity has long been intertwined with the game. The Bombay Pentangular (earlier Quadrangular, earlier still Triangular) Tournament took place from 1907 to 1946, pitting Hindus against Muslims, Parsis, Europeans, and "The Rest," comprising Indian Christians, Jews, and Buddhists. India's Muslims, pre-independence, were conditioned to root for their team based on religion. For many today, that tendency remains. In 2007, in a largely Muslim slum on the outskirts of Mumbai, residents packed into shops and stalls to watch cricket. It was the night of India's first World Cup match, against Bangladesh, and the entire nation had been whipped into a frenzy over the preceding months ("War in the West Indies!" proclaimed The Hindustan Times). But many televisions were tuned to a different game: Pakistan taking on Ireland. It was cricket diplomacy failing in the face of the Cricket Test. 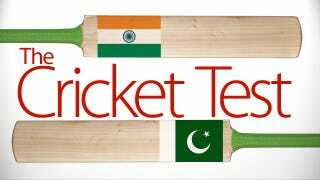 The Cricket Test is a favorite tool of the Bharatiya Janata Party (BJP), the nationalist party that advocates Hindutva, or "Hinduness." The concept is more racial than religious, but it's difficult to untangle the strands. "I would never say that cricket is not a game for them," said a BJP Member of Parliament, while acknowledging that 32 of the 256 men to play test cricket for India as of 2007 had been Muslim, a number in line with national demographics. "But a large number of fans want nothing to do with the Indian eleven. This is not their side. They have their own sides." Critics accuse the BJP of pandering and fear-mongering. But the distrust was amplified by the rise and fall of Mohammad Azharuddin, India's most successful captain of all time. Hailed as an ambassador of Hindu-Muslim comity, he united India while leading the squad to unparalleled success in the late '80s and '90s. It all came crashing down in 2000 when he was banned from the game for life after admitting involvement in a match-fixing scandal. "Everything we won is tainted because of Azhar," said student Gnyan Rushi as he watched India take on Pakistan at a Mumbai bar. "We will never know how much of what we achieved was legitimate, and it is all because of him. He hurt India more than anyone ever has. "It wouldn't have happened if he were loyal to India." The unspoken subtext, the proposed conflicting loyalty, becomes apparent as Rushi segues into a discussion of Marlon Samuels, a West Indian cricketer who in January was implicated in another scandal along with the notorious Dawood Ibrahim, a sort of Arnold Rothstein of the subcontinent. Ibrahim is the most powerful figure in India's Muslim-dominated underworld, and his crime syndicate has long been suspected in fixing cricket matches, often with the aid of Muslim players. "Zaheer Khan, at the least, has done well. Now I think there is at least one good Muslim in the world." The reactions on the streets of Mumbai and Lahore after yesterday's Indian victory remain to be seen. Despite the rash of articles proclaiming a new era of open relations, there will still be millions of Indian citizens who cheer for the "wrong" team, who are now lamenting Pakistan's loss. The Cricket Test shall be administered again, and again, and again. Portions of this article appeared in English-language Pakistani newspaper Dawn on May 13, 2007.